In C.N. 8538 Jeremy Silman (Los Angeles, CA, USA) asked about suggestions that Alekhine was found drunk in a field during his 1935 world championship match against Euwe. Noting that the subject of Alekhine and alcohol had been referred to in a number of C.N. items, we invited further documentation, adding: ‘The word documentation is stressed; frequently elsewhere the subject is treated merely as good for a gossip and a giggle.’ We also promised to gather C.N. material in a single feature article, as is now done here. For these dainty tidings no documentary source is given, of course, for the Walls of this world expect us to take on trust their attacks on the chosen prey of the day. It can only be guessed that he has gleefully seized and embroidered upon what Reuben Fine (strong master, undependable writer) said on page 54 of The Psychology of the Chess Player, but that really won’t do. Poach from a dubious source some suspect chitchat about a deceased master and whisk it up from an alleged one-off incident into a categorical denunciation of repeated misconduct. Yes, being a chess journalist is that easy. Even today, Wall still allows his words about Alekhine to appear on the Internet, although at a different site. ‘Benko: I have heard many rumors that Alekhine was drinking heavily during the match and was behaving strangely sometimes. Can you comment? Source: ‘Recollections of Alekhine’ by Harry Golombek, Chess Review, May 1951, pages 140-141. See too C.N. 1313. Golombek’s article can also be found on pages 191-196 of The Treasury of Chess Lore by Fred Reinfeld (New York, 1951). The relevant game from the 1935 Olympiad was not identified, but one possibility is Golombek v Horowitz. The former’s annotations on pages 480-481 of the October 1935 BCM referred to 24 h4 as a possible improvement suggested by Alekhine; at moves 28 and 33, shorter wins were pointed out by Golombek (without, however, any mention Alekhine). 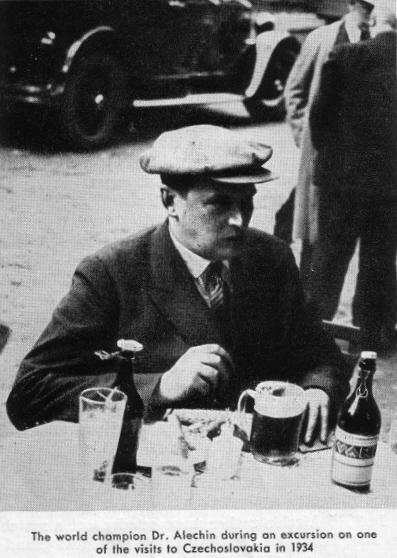 Alexander Alekhine’s heavy drinking is not in doubt, and Pablo Morán’s monograph on him has a chapter entitled ‘Exhibitions Under the Influence’. There are, though, inferior writers (which is certainly not a description of Morán) who enjoy pouncing on and blowing up any great master’s adversities. See, for instance, the examples quoted at the start of our article The Games of Alekhine. A person who writes that a champion played a world title match ‘more or less in a perpetual stupor’ is capable of writing any old thing about anyone. Latest update: 14 March 2014.